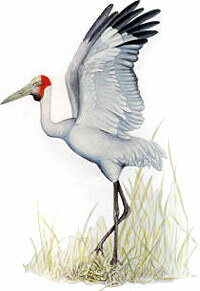 The brolga has featured on the Queensland Coat of Arms since 1977. It wasn't until January 1986 that it was announced as the official bird emblem of Queensland. Of the 14 species that comprise a worldwide family of cranes, brolgas (Grus rubicunda) are the only species native to Australia. Also known as the Native Companions, they can be found in grasslands and swamps along the Queensland coast, from Rockhampton to the Gulf of Carpentaria. Adult birds are predominantly grey and are characterised by a long thin neck, a bare head and a prominent patch of red skin behind the eye. They stand more than a metre tall on long, slender legs and their outstretched wings can measure up to two metres across.